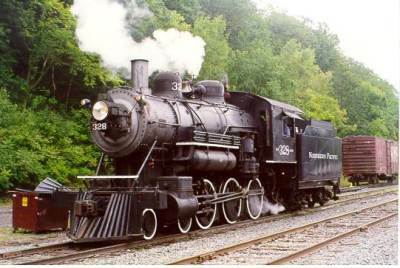 Steam locomotive 328 is a light 4-6-0 "Ten Wheeler" which spent years running branch line trains to small towns along the St. Croix river, like Stillwater, Grantsburg, and Taylors Falls. Those tracks are gone, but 328 survived in a city park in Stillwater. In 1981 it was restored to operation by the Minnesota Transportation Museum. Currently it is on display at the Jackson Street Roundhouse. The story begins in 1904, when the Chicago Southern railroad was incorporated to build 114 miles of track from Chicago to a connection with the Southern Indiana Railway. Fourty locomotives were ordered in 1905 from the American Locomotive Company's Rogers works in Patterson, New Jersey. The order included twelve 2-6-0 "Mogul" types, eight 4-4-0 "American" types, and twenty 4-6-0 "Ten Wheeler" types. The first sixteen were delivered in July and August, among them six 4-6-0's. By the end of 1905 the Chicago Southern fell on hard times, and the remaining fourteen 4-6-0's sat unfinished at Rogers, without a buyer. During the winter of 1906-1907, the Northern Pacific was experiencing power shortages on its Washington, Montana, Idaho, and Dakota branch lines. It purchased ten of the unfinished engines for $14,500 each. They were completed and delivered in February, 1907. The Northern Pacific assigned them class S-10 and numbers 320 to 329. In their early years, 321 and 322 were assigned to the Dakota Division, 320, 323, and 324 to the Pharoah Division, and the rest to the Minnesota Division. In 1925, 325 and 326 were re-assigned to the Montana Division. Small, light engines even when new, the great depression rendered them surplus. 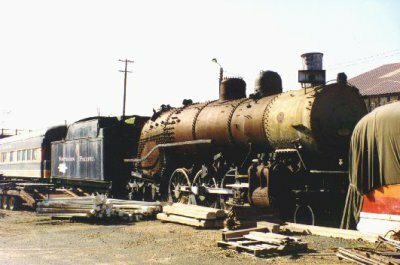 Between 1929 and 1933 eight were cut up for scrap. The two survivors, 321 and 328, remained because of their light weight and a rickety old bridge. The Northern Pacific's mainline from the Twin Cities to Duluth sported a number of branchlines. The seventeen mile branch from Rush City, MN, to Grantsburg, WI crossed the St. Croix river on a very light bridge. Only D-3 engines or S-10 engines like 328 were light enough to cross it safely. 321 and 328 also frequented the branches from Wyoming to Taylors Falls and from White Bear Lake to Stillwater. By 1946, dwindling traffic and the new diesels resulted in 321's scrapping. On July 1st, 1948, 328 pulled the last train to Taylors Falls. In 1949 L-10 O-6-0 number 1167 replaced 328 on the Grantsburg branch. 328 still found work on the Stillwater branch and pulling railfan excursions, but in March 1950 was retired. 328 was also ordered scrapped, but was saved by the Minnesota Railfan's Association, who managed to get it donated to the city of Stillwater. It was put on display in the park along the river, a couple blocks from the depot. In 1976 the Minnesota Transportation Museum leased the 328 and restored it to operating condition in the BN's ex-NP Como Shops in St. Paul. It pulled its first excursion train in 1981 during New Brighton's Stockyard Days festivities. Between about 1987 and 1991, NP 328 returned to the Stillwater branch. At that time the branch was owned by MTM, and 328 was a "crown jewel" of the historic experience. From 1992 to 1999 NP 328 served as a regular locomotive on MTM's Osceola & St. Croix Valley Railway, giving train rides to an older generation who remember when steam locomotives ruled the rails and exposing a new generation to steam locomotives and passenger trains for the first time. It ran between Marine on St. Croix, MN and Dresser, WI, a mere few miles from the Stillwater and Taylors Falls branches it once frequented. It also made occasional special trips to other locations around the Twin Cities. Volume 15 No. 4 The Truth About 328 Revealed! Also see the "Minnesota Railroad Guide" by Steve Glischinski, data p142. Steam locomotive 2156 is a light 4-6-2 "Pacific," built in 1909 to help handle the Northern Pacific's increasing passenger business. Based on the successful Q-1 class, Q-3 engines 2148-2170 were constructed by Baldwin (2148-2157) and Alco (2158-2170.) They were well-liked by the crews, capable of cruising at 95 mph. Vital stats: 200 psi superheated steam, 236,000 lbs engine weight, 69" drivers, 22"x26" cylinders, 31,000 lbs tractive effort. The Q-3s generally served the east end of the system, running west from St. Paul and Duluth, but 2156 is known to have been assigned to the NP's premier passenger train, the "North Coast Limited," between Livingston and Butte in Montana. By the 1930s, the Q-3s had been bumped from the main lines by newer, larger engines, but continued to lead long, productive lives on branch lines. The last left the roster in 1959. Of the seven classes of 4-6-2's on the NP, only members of class Q-3 escaped the scrapper's torch. The NP was very generous, donating a total of four to towns along the line. 2152 went to Auburn, Washington in March 1958. It remains on display, under a canopy roof. 2153 went to East Grand Forks, Minnesota. In 2000 MTM purchased it, and it has been moved to Jackson Street. 2156 went to St. Paul, Minnesota. It was displayed in Como Park until 1980, when MTM began its restoration. 2164 went to Bismark, North Dakota, where it is displayed at the Camp Hancock State Historic Site. In 1980 the Minnesota Transportation Museum leased 2156 for restoration and operation. Lagging was removed from the boiler, flues removed, and siderods and pistons disassembled for renovation before major damage was discovered. While on display, water had gotten into the fireman's side high-pressure steam passage, frozen, and cracked about a square foot out of the side of the steam passage. Since this is an inner part of the complicated cylinder casting, repair would not be cheap. "Minnesota Railroad Guide" by Steve Glischinski; text p142. "Classic Steam Era" by Lorenz P. Schrenk and Robert L. Frey; text, photos p88-94, data p288, diagrams p307, 308. Steam locomotive 2153 is a 4-6-2 "Pacific" built to pull the Northern Pacific's premier passenger train, the North Coast Limited. 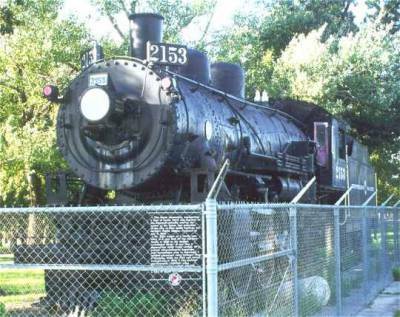 Retired in the fifties when the railroad switched to diesel locomotives, 2153 was donated to the city of East Grand Forks, MN, who displayed it in a city Park. In 2000 the city gave the 2153 to the Minnesota Transportation Museum. In reparation for movement to St. Paul, MN, the jewelry and jacketing were removed for safe keeping and the asbestos lagging abated. Upon arrival, the first task was cleaning up the journals on all axles. (They had been damaged by flood waters.) The main drivers were not bad, and were done by jacking up the engine. The trailing truck was done in the shop and then installed under the engine. The lead truck was the worst, and is still being repaired. Because 2156 and 328 are both being overhauled, 2153 will initially be cosmetically restored "so that something around here looks like a steam engine!" Already on exhibit, it needs its pilot truck, new running boards, cab roof, tender end beams, the jewelry, and some black paint. 2153 is a twin sister to the museum's NP 2156. Two other Q3s also survive, 2152 under a canopy in Auburn, Washington and 2164 at the Camp Hancock State Historic Site in Bismark, ND.